I’m Nosenzosenkosi Nyawo but you can call me Nos and just save yourself some time. I am a 21 year old living in Pretoria, however, born and raised in Swaziland. I recently graduated from the University of Pretoria in BSocSci Industrial Sociology and Labour Relations and currently studying towards my second degree in Bcom Human Resource Management, and yes, I am exhausted in case you were wondering. 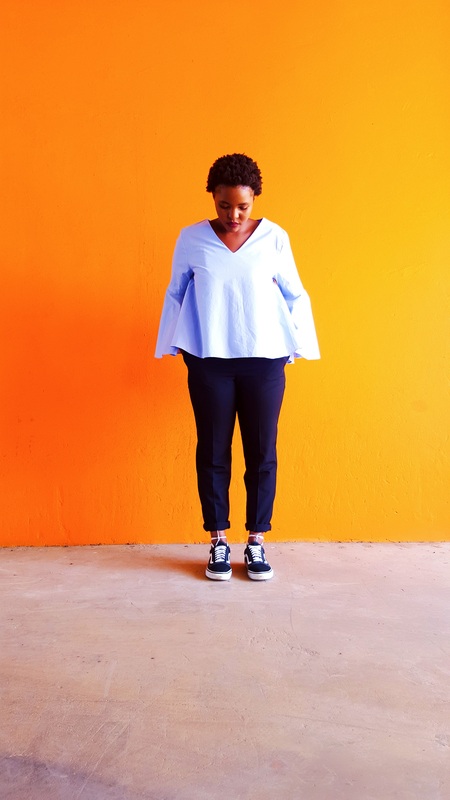 People have asked me on a number of occasions to sort of help them find their style even if it means me spending a day with them shopping for clothes that I think would look great on them. My first instinct is to say yes, which I always say, because I tend to not back down from a shopping trip whether it’s for myself or not. However, the truth is I do not have a personal style or rather you will not hear me admitting to having one because for me that restricts you in exploring not only fashion but yourself as an individual since style is what you make it. I believe your style is an expression of who you are and what has inspired you that day, month or year. 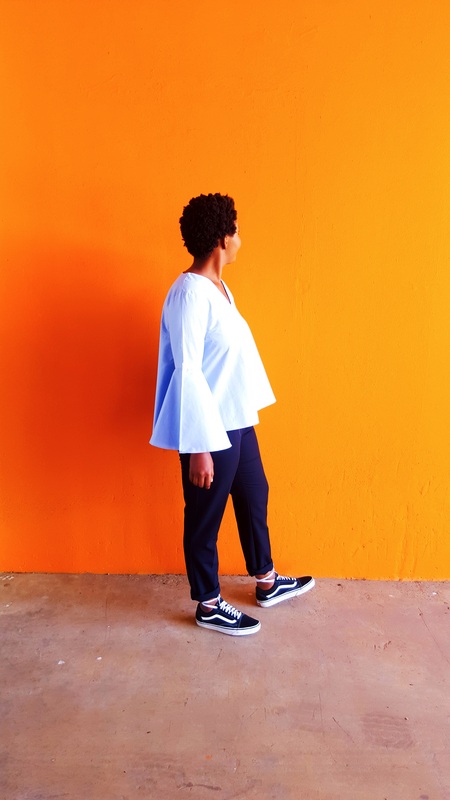 Trying to define my style in the past years has been rather frustrating because as humans we naturally seek for a particular identity that you can stick to and make your life rather less chaotic, and believe me, I have searched. I could not understand why it was so difficult for me to just, you know, pick a style or why I couldn’t walk into a store knowing what I wanted, what colour I wanted it in and should they not have it, not settle for anything but what I wanted because that was simply my style and nothing else would do. Listen, I have stopped searching. 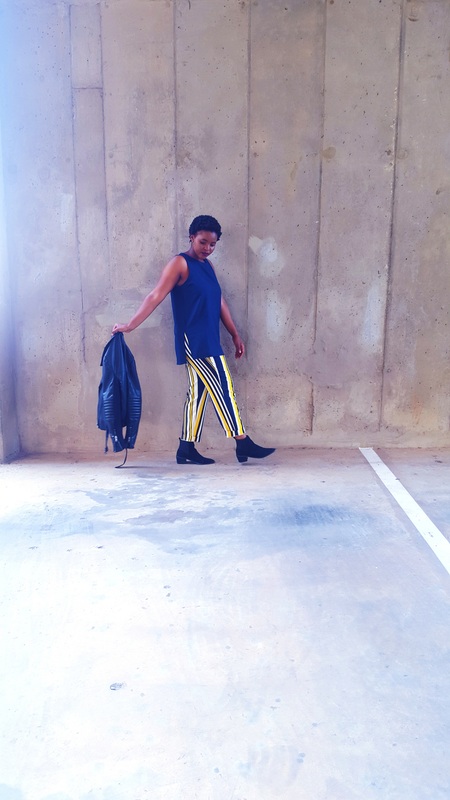 I have accepted that I will never commit to a certain style because there is so much more to fashion, you should be able to gracefully transition from one style to another and play around with it because style is an art. You get to tap into someone’s creativity just by looking at what they’re wearing, so why limit yourself? So putting my commitment issues aside, I am in actual fact broke. I cannot afford my style, or maybe I can, I just haven’t mastered the art of saving. I am yet to come across a student who loves clothes as much as I do and can still save in the process, I have hope that they do in fact exist. Let me tell you what I have been into lately, for the purpose of this blog post and my feature, and it’s a lot, so bear with me as I try and put everything into one sentence; androgynous, clean cut textured minimalistic neutral over-sized frayed jean bell sleeve 60’s and 70’s shenanigan. I have tried to incorporate all of this in just three outfits which can hopefully get you to a point where you understand where I am going with this. The oldie but goodie “white tee and blue jeans”. I have seen trends come and go but this will always be a steady classic which is why I chose it. 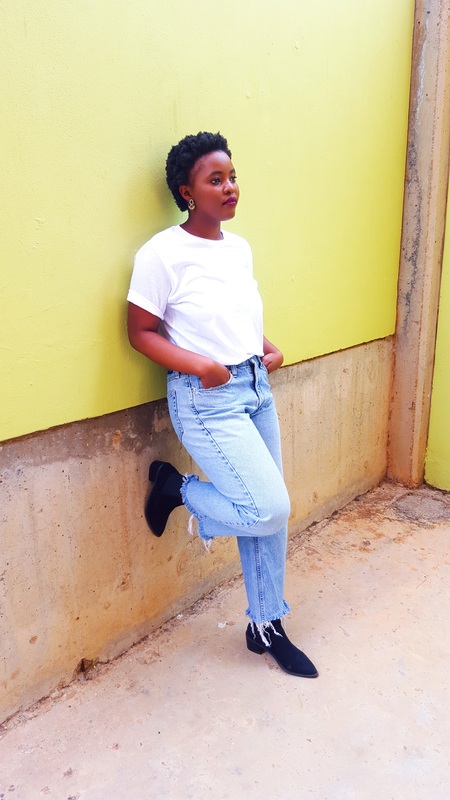 The white tee, which I bought at Mr Price from the men’s section because I wanted a more baggy fit to it, goes well with the light washed blue jeans with the fraying at the hem. 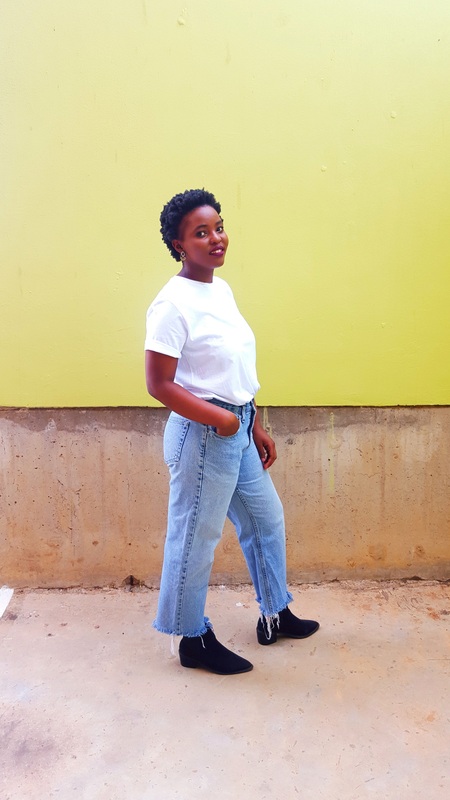 Now, just a bit of a back story about the jeans; I got them for R25 at a vintage market a.k.a “ka dobha phansi” or “bend and pick,” back home in Swaziland that happens every Wednesday and Thursday. I then cut them at the bottom and used sand paper to give that distressed look. So if you ever travel to Swaziland check out that place I promise you, you will never be the same again. 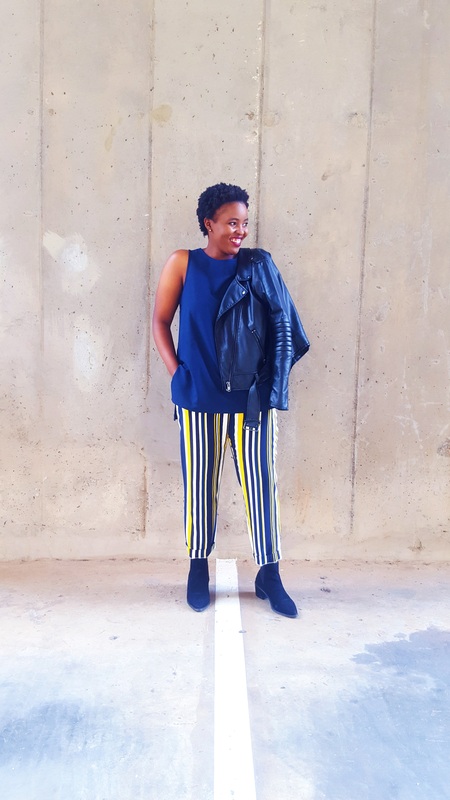 I then decided to pair the outfit with my trustee old black ankle boots and yes I’m that girl who wears boots all year round and statement earrings. This has to be my favourite outfit! 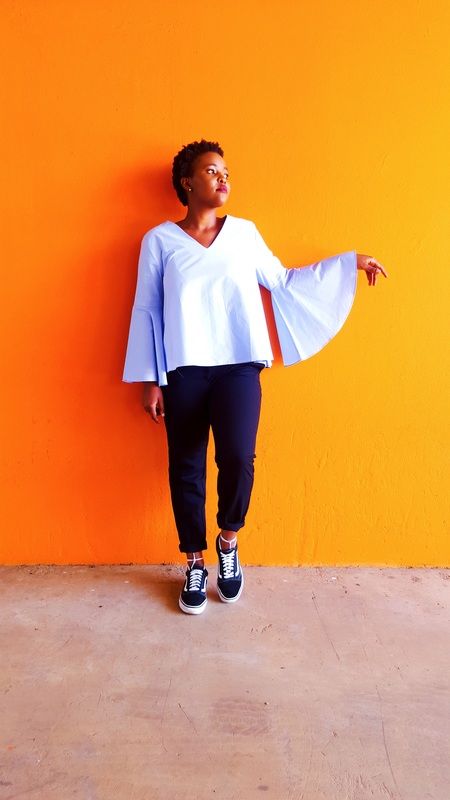 Its bell sleeved everything this season and I am hopping onto this trend. It has been in all fashion week catwalks all over the globe for the past couple of months and the bigger the sleeves the better. Can I just acknowledge that this brought nothing but chest pains because Gucci is making a statement of its own, wanting to be heard, forcing us to listen and it just reminded and reinforced the fact I’m playing and I need to push for that ‘glo up.’ I love versatility which is what this outfit has, you can easily take it from day, which is what I went for, to night by just adding a pair of statement heals and earrings to sass it up. 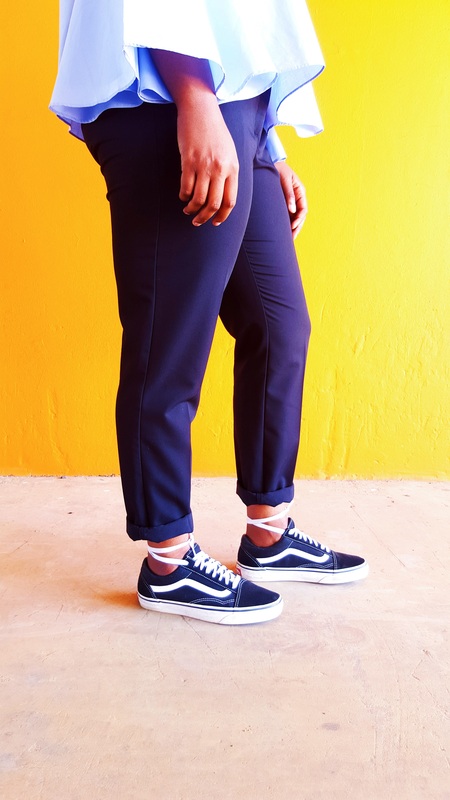 This outfit has to be the most androgynous out of all three. 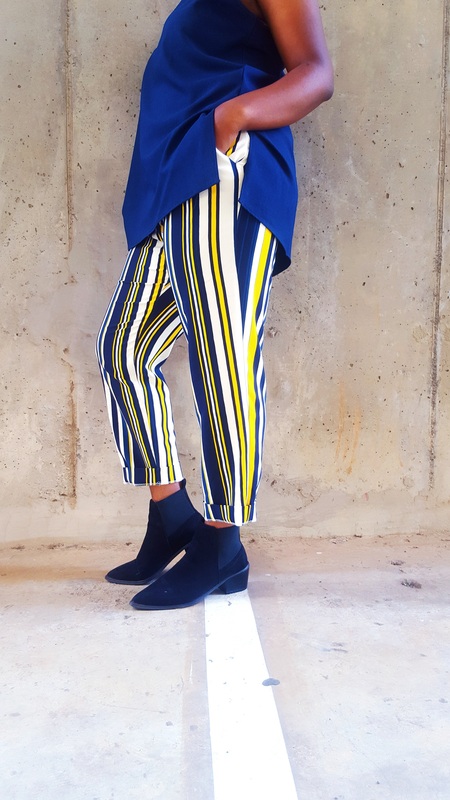 The focus of this outfit are indeed the pants because they scream boldness and the stripes have a 60’s/70’s feel to them. I did tone and balance it out with a navy blue straight cut top and black boots. To complete the outfit I accessorized it with a wardrobe essential, the leather jacket. Once again what an excellent read. Thank you Nos. The way I’ve been feeling Mr Price mens section lately ? Thank you rakgadi?, Lol can we transition together thou? Just dedicate ourselves to men’s clothing this season? Hahaha I’m glad you enjoyed it! !